For the past couple of weeks, the it's been fairly windy down here at pole. In addition to building impressive new sastrugi and several enormous (>10 foot tall) snow drifts, the wind-driven snow does an excellent job of obscuring the horizon. Because of that, we haven't been able to see the glow from the sunrise growing day by day. 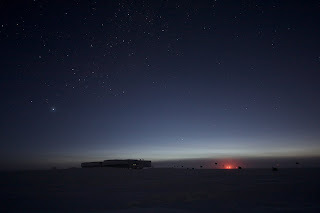 Well, on Friday, the clouds and wind finally cleared, and everyone on station was fairly shocked to see not just a faint glow in the sky, but a strong band of pink light along the horizon. 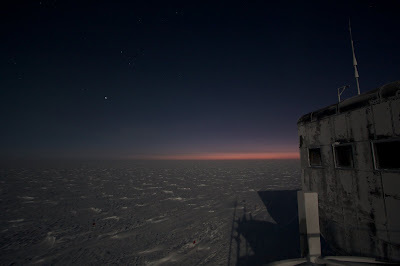 On Saturday the weather turned foul again, and by the time it cleared Sunday morning, the pink band had expanded into what passes for a rainbow of colors down here - a glow, orange through purple, covering a quarter of the sky. A conveniently timed lunar eclipse momentarily stole away our surrogate sun, and the true sunrise shone out over the darkened landscape. I've been thinking of the moon as a temporary sun for months now, but the sheer quantity of sunlight spilling over the horizon has left me marveling lately at how blindingly bright the real sun must be. Of course, it is - quite literally - blindingly bright, but that's the sort of thing you forget after months and months in the dark. If I didn't quite believe the Friday's pink band, Sunday morning convinced me. Something very primeval took over when I saw the full colorful glow of a sunrise, and millions of years of evolution kicked in to tell me that the day was dawning - to my mind it would be light out in a matter of hours. It's a month yet before the sunrise, but there's no reasoning with your instincts. By now, half the sky is aglow with sunlight. The moon is gone, but it's bright enough to see the major features on the path. With the exception of overcast or windy weather, my days of stumbling blindly to work and back seem to have passed. Things are changing in our world, and both light and color are returning. It'll be nice (if slightly surreal) to have them back. mercury and venus look amazing! Thanx for your blog. I like to read it. Great adventure. Could we count on you for an "official sunrise time" for our project?